In the picture above, north is at the top and the image covers 56.2 x 70.3 degrees. Image centre is located at 13:49:52.1, +39:54:41 (H:M:S, D:M:S, J2000). Astrometric data from Astrometry.net. 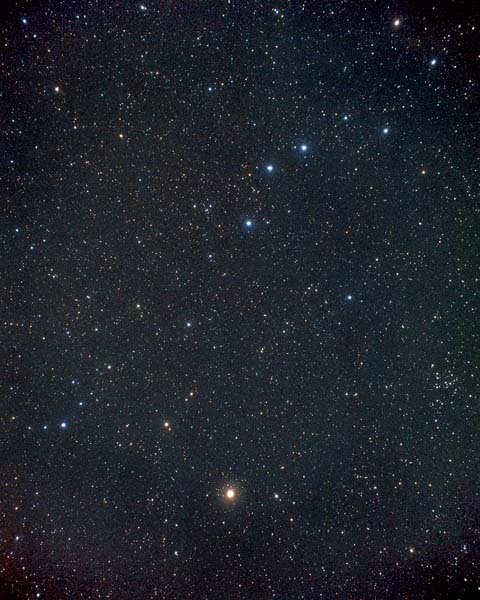 Canes Venatici (CVn, the Hunting Dogs) is an inconspicuous consellation introduced by Johannes Hevelius in 1690, nestling beneath the tail of Ursa Major. It represents the dogs Asterion and Chara, held on a leash by Boötes as the attack the Great Bear. The brightest star is Cor Caroli, named by Edmund Halley in memory of the king Charles I, King of England, or his son, Charles II. Asterion (Chara, β CVn), Cor Caroli (Canum Venaticorum, α2 CVn). Alkalurops (μ1 Boo), Arcturus (α Boo), Asellus primus (θ Boo, not visible), Haris (or Seginus, γ Boo), Hemelein Prima (σ Boo), Izar (Pulcherrima, ε Boo), Muphrid (η Boo), Nekkar (Meres, β Boo). Constellations adjoining Canes Venatici Boötes, Coma Berenices, Ursa Major. Coma Berenices, Corona Borealis, Draco, Hercules, Ursa Major, Virgo. David Malin, 2017 April 29.